Laugh will make your life easier! Live light like an Angel! Home » Geluk van binnenuit » Live light like an Angel! You know why angels can fly? Because they take life very light! I love this sentence and it connects with my feeling about humor in life. If you laugh a lot, life will be so much easier. Not because after a laugh all your problems has disappeared, but because if you laugh, all your problems and thoughts are just gone for a sec (or minute, depends on how long your laughter is). One of my mottos in life is “If you can’t laugh at your own joke, why should anybody else laugh at it?”. Of course this is the opposite of what most of the people say: don’t laugh at your own jokes! But I don’t get that one, because 1. I love to laugh; I prefer really loud laughter and 2. Like I said: if I don’t like my own jokes, why should you? And it’s not only my own and your jokes I laugh about. Sometimes I have to laugh really hard about a funny memory (out of the blue, sometimes in the bus or riding my bike… imagine how strange that one is), about a stress situation, about a sad situation or when I’m having a fight with my boyfriend (if I do this, he will even get angrier, so I try not to ;)). 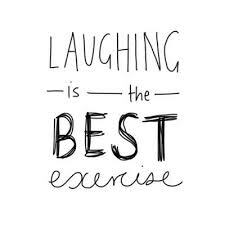 And every time I laugh, I feel like I lost a bit of weight (that would be a good diet actually!). But it’s true, I feel lighter, without that much tension in my body any more. At my first week here at Bali, it was hard to communicate in English. Not because I can’t speak English, but because the level of humor is different between cultures and countries. And I tried to communicate in a way they would understand my message, but it didn’t give me space to make any jokes. So I was getting pretty serious about everything. But off course it didn’t work out. So at that moment, I think it was day 3, I told myself: screw this, I will make my jokes and laugh at it like I always do. This is eventually my life motto, no matter in what language I have to speak. So I did and still do make a lot of jokes, I laugh about it and guess what: everybody is laughing with me. They do understand and if they don’t, they laugh because they don’t get it. So my point here is not to laugh at anything at any time, and to make a joke of everything. But just to realize that most of the times a good laughter will help you clear your mind and release tension in your body, your soul, a situation and between people. When a situation gets hard, or when you’re having a very serious conversation, or your totally lost and a bit desperate (been there, done that… like many times here at Bali), a laugh will help you out and after this beautiful laugh, you will feel like this angels. Just try it now and then and remember the feeling! The man I learned this really nice and helpful exercise from does this every day, he’s very happy and lives a light live! Live light, laugh a lot and fly like an angel!